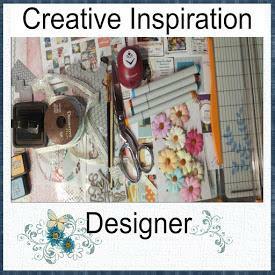 Welcome to the Creative Inspiration Blog Hop. For my challenge I have created a Lovely spring tag. I first prepped the tag with Gesso and then used Faber-Castell Gelatoes as a water color. I then used a TCW stencil with Dowler Rowney Mother of Pearl Structure Gel coloured with yellow Gelato on the tag for a bit of depth. I had some mesh lying around from some fruit so I used a small piece of that. I use a few pieces of chippies from Simple Stories. Also some Ribbon. The flowers are from the Dollar store. I made my own leaves from cardstock. The tassel is from Pink Paislee. If you choose to play along with our challenge then play along with any one or as many of the projects you saw in the blog hop. Post your project in the comments section and tell us which one you played along with. You have all month long to play along. Can't wait to see what you share with us. Oh Jackie! What a GORGEOUS tag! Perfectly Spring-y!!! Jackie that is just stunning. Makes me want spring even more. Gorgeous tag Jackie! So many details! LOVE, Love, Love! Using the fruit mesh - very inspired - need to go check my fridge! I just adore the details that have gone into this tag! That is such a beautiful tag! Love the colors, the flowers are lovely, so many details to gaze upon!